President Muhammadu Buhari on Wednesday expressed the belief that despite the scoffing of a minority number, Nigeria is resolutely on the road to a new dawn. A statement by his Special Adviser on Media and Publicity, Mr Femi Adesina, quoted the President as saying this while commending two security men who returned a handbag filled with valuables forgotten at the Murtala Muhammed International Airport by an American returnee. Buhari asked Nigerians to emulate the security men, saying such conduct reflected the new Nigeria that we all desired. The President urged Nigerians to bring out the best in themselves at all times, noting that with such minds, they could never be hoodwinked again by those who seek power for selfish and dubious reasons and return the country to an inglorious past. “Nigeria will no longer be a byword for corruption and plundering of public resources. That is the path we have chosen to take, and our country will eventually get to a new shore,” Buhari said. A Lagos-based medical doctor, Banji Oyegbami, was said to have met a family returning from America at the airport on August 18, 2018. In the process of loading their luggage into the car of their host, the handbag of the returnee’s wife reportedly fell, unknown to anyone. About 90 minutes later, an officer of Halogen Securities who was on duty at the airport called the couple to come for the retrieved bag. The grateful couple offered a generous gift, but Messrs Francis Emepueaku and Achi Daniel, declined, saying they were merely doing their duties. Meanwhile, the management of Halogen Security Company Limited has honoured the two guards for displaying honesty at their duty post. 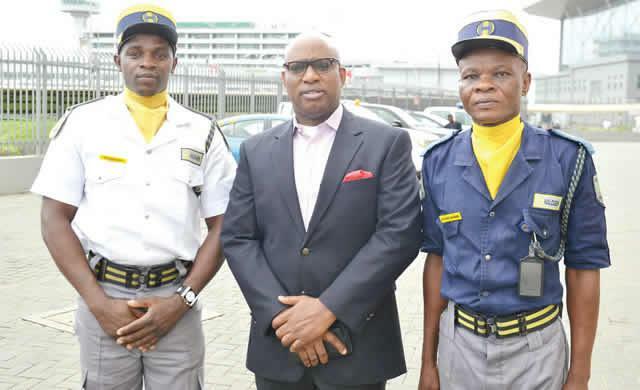 The company’s management singled them out for honour with an early morning ceremonial parade by their colleagues on Wednesday, August 22, 2018, at the Murtala Muhammed International Airport. 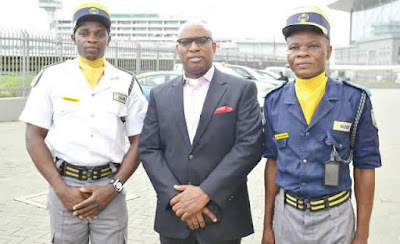 In his commendation speech, the Group Managing Director, Wale Olaoye, expressed deep satisfaction at the open display of integrity by the two guards. He observed that they exhibited Halogen Security’s intrinsic values.